We know that drinking too much alcohol is bad for us. It gives us hangovers, makes us feel tired and does little for our appearance – and that is just the morning afterwards. [Report by Philippa Roxby, Health reporter, BBC News] Long term, it increases the risk of developing a long list of health conditions including breast cancer, oral cancers, heart disease, strokes and cirrhosis of the liver. Research shows that a high alcohol intake can also damage our mental health, impair memory skills and reduce fertility.The direct link between alcohol and the liver is well understood – but what about the impact of alcohol on other organs?Numerous heart studies suggest that moderate alcohol consumption helps protect against heart disease by raising good cholesterol and stopping the formation of blood clots in the arteries. However, drinking more than three drinks a day has been found to have a direct and damaging effect on the heart. Heavy drinking, particularly over time, can lead to high blood pressure, alcoholic cardiomyopathy, congestive heart failure and stroke. Heavy drinking also puts more fat into the circulation of the body.The link between alcohol and cancer is well established, says Cancer Research UK. A study published in the BMJ this year estimated that alcohol consumption causes at least 13,000 cancer cases in the UK each year – about 9,000 cases in men and 4,000 in women.Cancer experts say that for every additional 10g per day of alcohol drunk, the risk of breast cancer increases by approximately 7-12%. 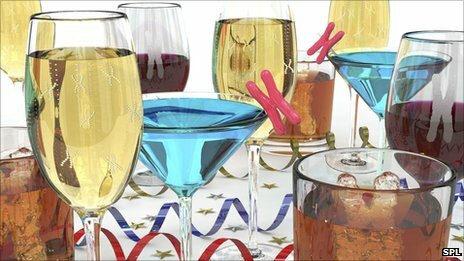 For bowel cancer, previous studies show that increasing alcohol intake by 100g per week increases the cancer risk by 19%.A recent report in BioMed Central’s Immunology journal found that alcohol impairs the body’s ability to fight off viral infections.And studies on fertility suggest that even light drinking can make women less likely to conceive while heavy drinking in men can lower sperm quality and quantity.Why alcohol has this negative effect on all elements of our health could be down to acetaldehyde – the product alcohol is broken down into in the body.Acetaldehyde is toxic and has been shown to damage DNA.Dr KJ Patel, from the Medical Research Council’s laboratory of molecular biology in Cambridge, recently completed a study into the toxic effects of alcohol on mice.His research implies that a single binge-drinking dose of alcohol during pregnancy may be sufficient to cause permanent damage to a baby’s genome.Foetal alcohol syndrome, he says, “can give rise to children who are seriously damaged, born with head and facial abnormalities and mental disabilities”. Alcohol is a well-established cancer causing agent, he says. “You cannot get a cancer cell occurring unless DNA is altered. When you drink, the acetaldehyde is corrupting the DNA of life and puts you on the road to cancer. Dr Nick Sheron, who runs the liver unit at Southampton General Hospital, says the mechanisms by which alcohol does damage are not quite so clear cut. Alcohol is undoubtedly a public health issue too.Earlier this year, NHS figures showed that alcohol-related hospital admissions has reached record levels in 2010. Over a million people were admitted in 2009-10, compared with 945,500 in 2008-09 and 510,800 in 2002-03. Nearly two in three of those cases were men.At the same time the charity Alcohol Concern predicted the number of admissions would reach 1.5m a year by 2015 and cost the NHS £3.7bn a year.Last year, a study in The Lancet concluded that alcohol is more harmful than heroin or crack when the overall dangers to the individual and society are considered.The study by the Independent Scientific Committee on Drugs also ranked alcohol as three times more harmful than cocaine or tobacco because it is so widely used. So how much alcohol is too much? What can we safely drink? Did you know? There are 16g of alcohol in a 175ml glass of red or white wine. The many biblical references to alcoholic beverages are both positive and negative, real and symbolic, descriptive and didactic. Both archaeological evidence and written records indicate the significant cultivation of grapes in ancient Israel and the popularity of wine-drinking. The production capacity apparent from archaeological remains and the frequent biblical references to wine suggest that it was the principal alcoholic beverage of the ancient Israelites. The Drunkenness of Noah by Giovanni Bellini:The consequences of the drunkenness of Noah and Lot “were intended to serve as examples of the dangers and repulsiveness of intemperance.” The title character in the Book of Judith uses the drunkenness of the Assyrian general Holofernes to behead him in a heroic victory for the Jewish people and an embarrassing defeat for the general, who had schemed to seduce Judith. On the whole, biblical literature displays an ambivalence toward intoxicating drinks, considering them both a blessing from God that brings joy and merriment and potentially dangerous beverages that can be sinfully abused.The relationships between Judaism and alcohol and Christianity and alcohol have generally maintained this same tension, though Christianity saw a number of its adherents, particularly around the time of Prohibition, rejecting alcohol as inherently evil. Should pregnant women drink alcohol? The Completed Religion, does not need Innovations!